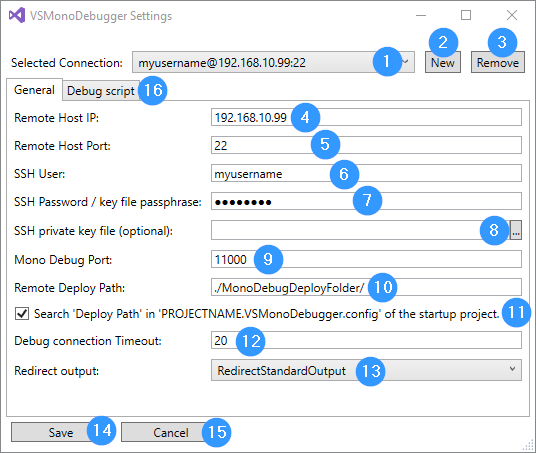 Enables Visual Studio 2017 to deploy and debug a .Net application on a remote Linux machine with mono installed over SSH. You have to save a valid SSH connection first! All changes are saved after you click on "Save"
 All changes are discarded if you click on "Cancel"
 For further script information click on "Script information"
You can deploy your "Startup project" output to the remote machine via SSH configured under "Settings". To speed up deployment, SshFileSync is used. To upload only changed files, an additional cache file '.uploadCache.cache' is stored in the destination folder. Don't delete this cache file! You can start a debug session in Visual Studio 2017 on the remote machine. You can run both commands in one step. 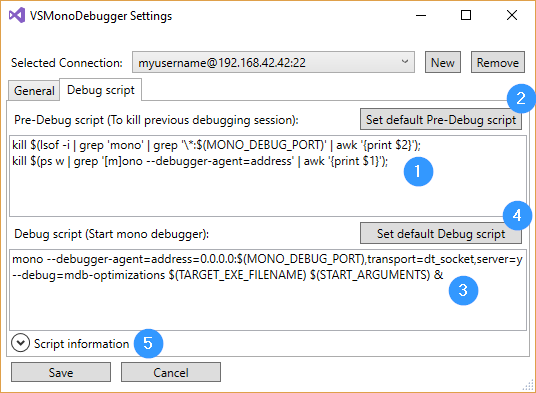 Menu "Mono"/"Deploy and Debug (SSH)"
You can debug a mono process that is already waiting for a debugger. SSH is not necessary. Only one TCP connection is required. The mono process must be started manually with the necessary arguments. Menu "Mono"/"Attach to mono debugger (without SSH)"
You can build the startup project and all dependent projects. Additionally the mdb files are created. This is necessary for the support "Attach to mono debugger (without SSH)", because the mdb files must be present in every output directory of dependent projects. Menu "Mono"/"Build Startup Project with MDB Files"
[ ] Why can't the Mono.Cecil.Pdb.NativePdbReaderProvider type be found in Visual Studio to support pdb files? [ ] When using the ProvideAutoLoad attribute, your package (VSMonoDebugger.VSMonoDebuggerPackage) class should derive from AsyncPackage instead of Package to improve performance. Read more about using AsyncPackage here: https://aka.ms/asyncpackage. [x] Support break points in referenced projects. *.mdb files are searched locally in each output directory, so we need mdb files in each project output directory (see Mono.Cecil.Cil.DefaultSymbolReaderProvider.GetSymbolReader()). [x] Bugfix: Support break points in referenced projects. *.mdb files are searched locally in each output directory, so we need mdb files in each project output directory. 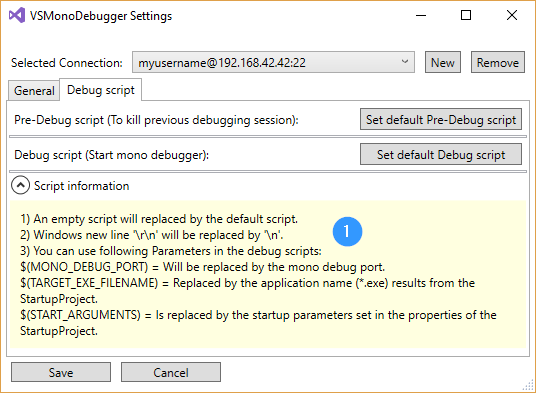 [x] Feature: Add new menu item "Attach to mono debugger (without SSH)"
[x] Feature: Add new menu item "Build Startup Project with MDB Files"
[x] Feature: Error logging and handling improved for StartDebuggerAsync if a script has syntax errors.